Faster Better Media� are faster and sharper. At many times the usual speed, Faster Better Media's gel with LB� conductive media harness 400 to 600 volts in a standard gel (300 to 500 volts if using SB�). You can now separate DNA fragments lightning fast without excessive heating of the gel. A tris acetate EDTA or tris borate EDTA gel tolerates only 110 volts, takes three times as long to run, and results in fuzzy DNA patterns. Tris also produces loads of unwanted heat - heat that limits the voltage that can be used. Paired identical mini-horizontal rigs, 10 cm gel length, were used. Samples of defined markers and multiplex PCR products in 1X tris or SB loading medium were loaded into wells of 2.0% agarose gels. As in -- extremely sharp. Have you ever seen right angles on the corners of DNA bands in agarose? See for yourself. Click the figure at right to enlarge. 2% agarose horizontal gels. All pictures on this page are from otherwise routine 5 mm-thick 10 cm-long fresh-poured submarine minigels. No molded plastic cases. No pre-casts. No cooling system. Just a slab gel in a reservoir with two electrodes. 100 bp band at bottom. As in -- extremely fast. This ladder was resolved in 8 minutes. Less than 8 minutes would have sufficed for most applications. Some investigators tell us they screen PCR products routinely in 4 minutes. No more lunch breaks during agarose electrophoresis. 2% agarose routine horizontal submarine gel, of the kind you probably have in your lab. 100 bp band at bottom. Faster Better Media� are cooler. After 16 minutes at 350 volts, the SB and LB gels remain surprisingly cool. 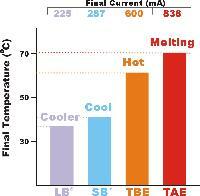 Tris-based gels overheat or even melt under the same conditions due to a runaway positive feedback loop that drives their current and power consumption skyward.